St Mirren striker Craig Dargo has signed a new two-year contract, but midfielder Gary Mason and defender Will Haining are to leave the club. The Scottish Premier League outfit has announced that Mason and Haining will not be offered new deals when their present ones end at the end of June. Dargo, who joined the Buddies in 2007 from Inverness, had been reportedly attracting interest from English clubs. But the 31-year-old has extended his stay at St Mirren Park. Dargo, who began his career with Raith Rovers and also played in Scotland's top flight with Kilmarnock, scored four goals in 30 appearances during his last injury-hit season with the Buddies. 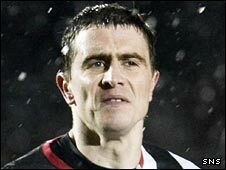 The 29-year-old Mason and 26-year-old Haining had also joined St Mirren in 2007. Mason, who launched his career with Manchester City and arrived in Paisley after leaving Dunfermline Athletic, made 25 appearances last term. Haining joined the Buddies from Oldham Athletic and played 23 times in the season just passed. St Mirren have signed defender Lee Mair from Aberdeen this summer. Former Falkirk striker Michael Higdon was brought in as a replacement for fellow target man Jim Hamilton, who was released at the end of the season. But they lost defender Marc McAusland, who rejected a new contract to sign for First Division Queen of the South.